Put those Wes-missing tears on hold, because according to a new bodysnatching twist and a chilling ICE cry for help, our beloved waitlisted puppy might not be dead after all. Those burns, though… no, he’s super dead. Right? Probably? Hmm. Season 3, Episode 12 of ABC’s How To Get Away With Murder opens on Wes (Alfred Enoch) darting out of Frank (Charlie Weber)’s sight on the night of the fire. He scoots into a taxi, ignores a call from Laurel, phones an In Case of Emergency number instead, and announces, “It’s Christophe.” Whaaaaat? Okay, think, think. Who else would know Wes’ biological name? Is the mysterious contact Eve? Some random Mahoney? Annalise herself? The Feds??? This is madness. Oh, and WES’ BODY IS MISSING. How do you get away with losing a body?! This seems unacceptable even on fake TV terms. As of now, all signs point to the D.A.’s office attempting to cover up whatever nutso crap they pulled on and after the night of the fire by forging Nate (Billy Bush)’s signature on a body transfer form. Our favorite beefy middleman could be going down. But we can’t even be sure he’s innocent, because another flashback shows Nate encountering Wes at Annalise’s shortly after his dabble into Christophe-any! This is so damn confusing. We need Cicely Tyson to hold us close, tell us how thin we look, and smile bravely through it all. Oh good, here she is now. 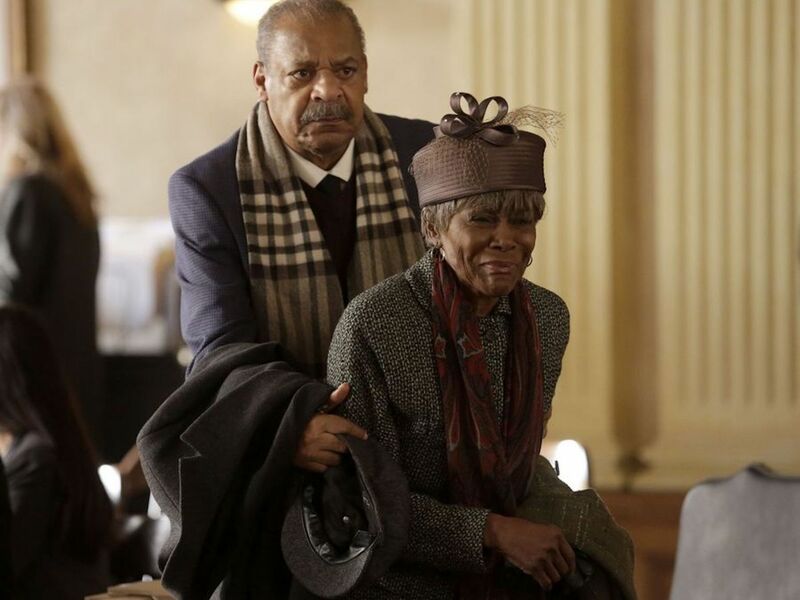 Annalise (Viola Davis)’s parents Ophelia and Mac (Tyson and Roger Robinson) show up at her arraignment against their daughter’s will. But what’s even more crushing than them watching her waste away in prison — “I’ve never seen you quite so low, baby” — is that Ophelia shows signs of dementia. She offers to take the fall for burning down the hooch-splattered house, but she’s understandably getting the Law Office of Annalise mixed up with the childhood home of Anna Mae. Her husband never knew Ophelia was the one who torched his sexually abusive brother alive. He claims he can’t remember learning about the abuse, but Annalise knows. He knows, too, but hey, that’s all in the past. Mac seethes at Annalise for being the selfish one right here, right now – if she really wanted to help her mother, she’d be trying to get out of this jail. Reeling from her parents’ visit and news that Bonnie (Liza Weil) still can’t get a bail approval even though the “murder” victim has vanished, Annalise baits her cellmate into pounding her to a pulp (on an insinuation of child molestation, no less) — essentially one-upping Wes’ missing body by erasing her face. The D.A. might not own up to “railroading a prominent African-American woman,” but Bonnie’s iPhone pics don’t lie: Annalise’s fellow inmates could kill her. Just like anyone could kill anyone. Released on conditional bail, Annalise convinces her mom the charges have been dropped entirely, and you can see Ophelia’s heart lift up right over the dinner table as the two shake with tears and gratitude for each other. For just a few moments, mother and daughter get to run far away from reality — her father’s specialty — while he stays put. Meanwhile, Laurel (Karla Souza) is spiraling on “Discharge Day” (ew). Fresh out of the hospital with minimal bandages and lots of emotions, she lashes out at all the “tragedy whores” hoping for screen time at Wes’ absurd memorial. “Go cry somewhere else,” she screams. How dare these phony asses remind the Keating 4 that they are in fact still in law school? Total amateur hour. Time to step it up and manipulate Nate into a jaw-dropping field trip to the morgue. Laurel’s still AWOL as the rest of the group learns Wes’ body is missing, but Michaela (Aja Naomi King) tracks her down. She’s still in Annalise mode, so she acts as Laurel’s lawyer and takes her to see Frank in prison so Laurel can scan his wildly piercing stares for intuitive tells. The eyes have it: Laurel’s convinced Frank didn’t kill Wes. That was easy. “He wouldn’t do that to me,” she stammers to the rest of the nervous nellies as Bonnie ice-glares her from behind. Desperately seeking closure, Laurel visits Wes’ apartment and weeps in a pile of his neutral plaid shirts. She could light one of the three HUGE turquoise candles on a single bookshelf (??? ), but opts for the natural musk of a sleeve instead. …Oliver’s maniacal laughter! The team’s loyal hacker (Conrad Ricamora) has quite a day spinning a full 180 from panic attack to pants-on-fire. He lies to the cops that he totally did not wipe Annalise’s phone, then boastfully shows Connor (Jack Falahee) his special “escape route” flash drive that proves that he did. His commitment to self-preservation knows no ends, and Connor’s growing increasingly sullen and twitchy in the face of just how easy it is for Oliver to lie. What else is Oliver keeping from him? Why was Oliver the one who snapped at Annalise’s simpering campus nemesis Simon Drake at the memorial? Only Ollie and his screen collection know the truth. Finally, Frank ditched his lawyer from prison, so he and Bonnie get to have all their mystery-laced conversations in private now, as co-counsels. What could possibly go wrong? Thud. MURDER.